It seems like only yesterday that I reported to work at Shell’s Bellaire Research Center. Gus Archie was already gone but Monroe Waxman (Waxman-Smit’s equation), Bob Purcell (developed mercury injection capillary pressure), Jerry Lucia (Rock-Fabric Carbonate Pore Classification) and many other fine professionals were always willing to take time to explain their trail-breaking work to a neophyte. In those pre-computer days (Schlumberger’s CSU truck was not yet operational), petrophysical evaluations were, by necessity, very different than today. And yet with skill, insight and experience, petrophysicists such as Lou McPherson (who ran Shell’s Petrophysics Training Program) were able to evaluate intervals that, even today, would challenge the computer. Computer interpretations, deterministic and probabilistic, typically place many evaluation options at our disposal, and are without doubt a major step forward. Unfortunately, in an era where animated power point slides are the norm, it’s also possible to over-look fundamental, under-lying petrophysical concepts that remain valid, whether applied with log-log graph paper or the latest probabilistic software. The surface to volume ratio of a sphere is (4 p r 2 ) / (4 p r 3 / 3 ) ~ 1 / r . This relation reveals that pore surface area becomes a relatively larger issue, as the pore radii decreases (1 / r increases). In the case of water wet rock at some specific height above the free water level, one then anticipates an increased Sw, as pore size decreases. Archie, who was in fact far more than Archie’s equation, documented this relation in his 1952 publication (Classification of Carbonate Reservoir Rocks and Petrophysical Considerations) with a graphical display of Porosity vs Water Saturation. With Porosity along the vertical axis and Water Saturation plotted horizontally, Archie found that discrete pore sizes trended along approximately hyperbolic lines of roughly constant product value (ie Porosity * Water Saturation = Constant): Figure 1. Larger pores corresponded to lower constants, because the (water wet) surface area / volume ratio decreased. · water cut might be expected, even though the water saturation might be low. While Buckles Plots are not so common in today’s computer interpretations, the underlying relation is behind the common depth-oriented display of Phi * Sw and Phi * Sxo. Volume Water, also be quantified. 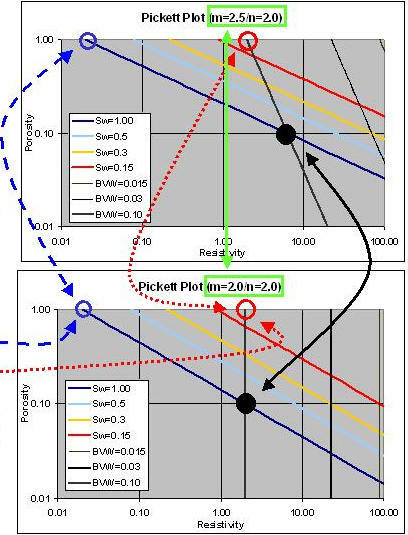 Interestingly, John Doveton of the Kansas Geological Survey tells us that Pickett himself never referred to the protocol as a Pickett Plot, and that the name was in fact attached by others. Roberto Aguilera remembers G. R. Pickett as a true Giant and a great professor of petrophysics. He always tried to teach us to stay away from what he used to call the cookbook school of thought. •Points of constant water saturation will plot on a straight line with slope related to cementation exponent "m"
Although Bulk Volume Water and Pickett Plots are less commonly seen today, than in years past, they remain powerful, quantitative pattern recognition tools. Furthermore, as pointed out by Aguilera, it’s possible to combine the two concepts into a single graphic, thereby compounding the utility of the graphic, achieving Double Duty: Figure 3. 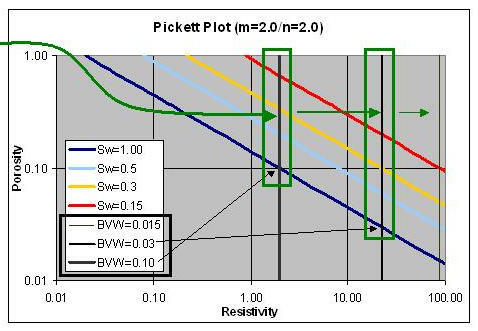 The BVW = Constant (single pore size) grids are vertical lines, on the Pickett Plot. "m" Not Equal to "n"
•"n" relates to the tortuosity of the conductive phase and as Sw decreases the associated rise in resistivity of a specific porosity is greater than what would have occurred at a lower "n" value. 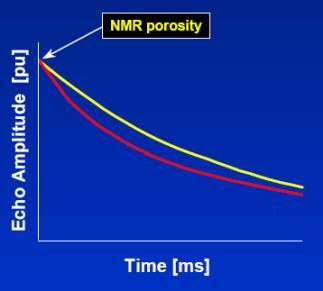 •Alternatively, the Sw associated with a specific porosity & resistivity increases as "n" increases. Note that in some cases, this Double Duty situation could even allow one to deduce "m" from a water leg analysis, and "n" from the hydrocarbon zone response (actually "m - n", but with "m" known from the water leg, it will be possible to deduce "n" ). Although the two (BVW and PP) concepts were once common, they are less commonly seen today, than 30 years ago. In fact, during a recent course presentation I was told that the Bulk Volume Water concept was only useful in ‘big Middle East Fields’: even though the individual who made that statement was almost certainly receiving NMR interpretations that included Bulk Volume Irreducible. 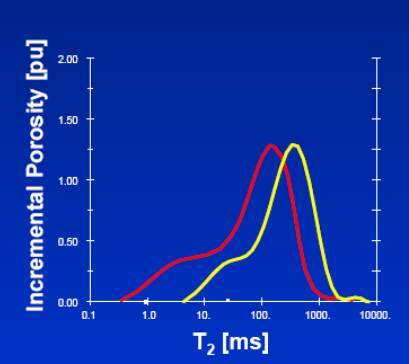 Today’s nuclear magnetic resonance measurements typically yield a mineral independent porosity and a pore size distribution (and potentially yet more): Figures 6 & 7. •BVI - Bulk Volume Irreducible water which includes water retained by capillary forces in small pores, and water wetting pore surfaces. •BVM - Bulk Volume Moveable, (Free Fluid Volume) which is porosity available for hydrocarbon storage and fluid flow. The NMR pore size distribution is often further characterized in terms of Bulk Volume Irreducible; the fraction of the porosity expected to be filled by capillary bound water, above the transition zone. When Phi * Sw(Archie) ~ Bulk Volume Irreducible (NMR), water free production can be anticipated, even if Sw is relatively high (high capillary bound water). On the other hand, low BVI (NMR) could signal water cut, even though Sw (Archie) is relatively low (but greater than BVI (NMR)). Be aware that specific cutoffs should be tailored to the reservoir / rock type in question. In those cases for which we have conventional porosity and resistivity logs, plus an NMR, it’s now possible to combine The Old and The New, by annotating (in the “z" direction) the Pickett Plot with NMR T2 results, thereby compounding the value of the two perspectives. With today’s tool technology and computer power, it’s easy to over-look the Tried And True Methods of Yester-Year. A better approach is to retain the traditional methods (as appropriate) and build upon them with today’s technology and computer power. In addition to ensuring internal consistency of data / interpretations, one could conceivably develop improved evalualuation for legacy data which does not include the modern tools. height above free-water table, and Winland r35 values on Pickett plots. 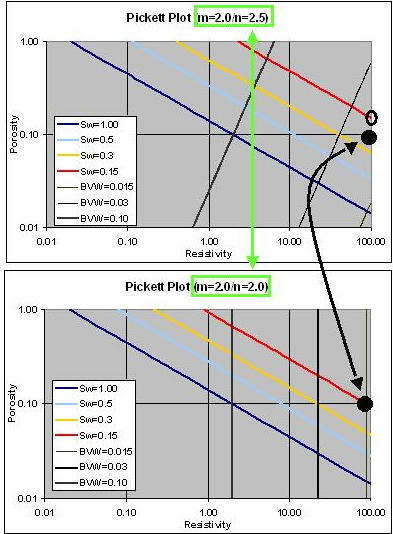 characterization of carbonate reservoirs through Pickett plots. Petroleum Technology (November 1966): 1425-1435.
offers Integrated Consulting Services . Predicting Reservoir System Quality and Performance.